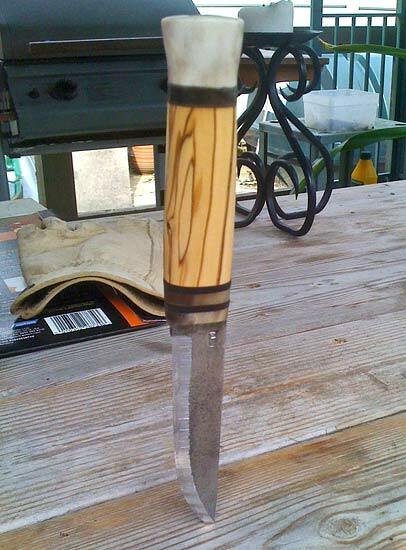 I’ve noticed a couple of people have sent in finished articles regarding their Julius Pettersson Knife. So, getting in the spirit of things I thought I would do the same. Other than purchasing the blade itself and the pommel section of Reindeer Antler, the other materials have been collected on rambles with my son Alex. The thin coin sections are deer antler from the nearby fields, they have been separated with sections of deer leather given to us by the local game keeper. The central wood section was brought back from an olive farm in Corfu, from a dead olive branch. Yes, I did get funny looks from immigration! Avidly watching the Ray Mears Bushcraft DVD – where Ray manufactures his knife in a log cabin – and driving my good lady steadily bonkers by replaying it. I followed the method carefully cutting and drilling each section to follow the decreasing shape of the tang. I then glued it all together with waterproof woodglue, and riveted the pommel end. I then left it out of direct heat for two days before commencing the sanding down. After achieving the approximate desired shape, and once life and the use of my right arm came back to me, I started shaping the handle with sandpaper, gradually reducing the grit until achieving a smooth tactile feel (seen in the picture above). I then smelted some solder in a crucible and filled the porous section of the pummel after dosing the visible section of the tang, and sanded it smooth, thereby sealing the top section of the handle from the elements. 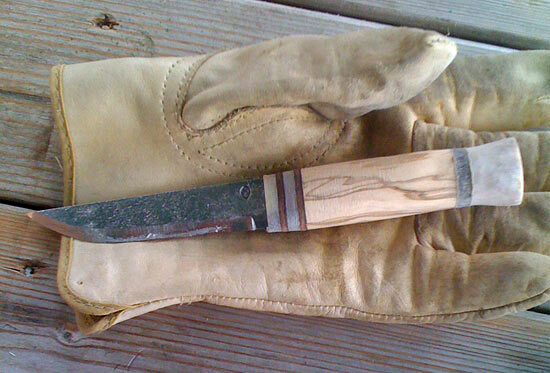 After a good dressing of Linseed oil, the knife was finished. I just have to find a good saddler to get the right leather to commence the sheath, not to mention learn how to do it! This entry was posted in Bushcraft Clothing & Equipment, Customer Posts on May 8, 2012 by Woodlore Team. Very nice indeed, Q: with the leather sections and wet, dry, wet, dry conditions does the leather decompose/shrink and loosen the blade from the handle. Yeah, really nice. Olive wood is really hard so it’ll last forever! Astonishing how the lindseed oil brought the grain out!